Form has always tended to operate as a mechanism of control in architecture. Whether through the ancient orders, Renaissance systems of proportion, or 19th century theories of tectonics, form has provided architecture's symbolic value, its organization, and literally given shape to its materials and structures. This tendency is stronger than ever today, despite the illusion of freedom provided by digital technologies of design and manufacture and the new geometric possibilities they offer. No matter how sophisticated the modeling software or automated the assembly, a project's form still exists as an underlying framework, static and rational, entirely circumscribing the processes of design and construction. Today -- largely due to a near ubiquitous faith in digital technology and complex geometry -- architecture lacks intelligent or innovative approaches to form. The formless was articulated as a philosophical construct by Georges Bataille, a man with a famous antipathy for architecture. But Bataille's hostility was due more to his myopic view of architecture than any fundamental incompatibility between his ideas and architectural practice. Bataille could only see architecture as form -- it was always a metaphor or a symbol: a stand-in for the body, the state, or an institution. But in his Critical Dictionary, the same document that included his notoriously hostile "definition" of architecture, Bataille praised the formless qualities of space. And his notion of the formless was deeply physical, grounded in a discourse of base materiality. Ironically then, there may be no better place for Bataille's ideas to take root than architecture, provided it is no longer conflated with form. Form suppresses material, and tends to either idealize architectural materials or dematerialize architecture altogether. In response, we propose a fundamental shift from material -- that which is sublimated or invested with symbolic power -- to matter -- that which simply is. This distinction between symbolic material and raw matter is particularly urgent given the increasing importance of sustainability in contemporary design. The very phrase "green design" already reveals that sustainability today is as often about symbolism or metaphor (if not branding) as about genuinely responsible consumption of resources. While not overtly "green," our formless advocates a new creativity and freedom in the use of materials. We embrace the raw, the unprocessed, the unstable, the ephemeral, and the degradable. Most of all, our formless seeks to exploit found conditions, to use what already exists. A material like bamboo may scream sustainable, but as often as not it is shipped halfway around the world to the construction site. We would rather build with the dust, dirt, and gravel already there. One might look sustainable, but which is the more responsible use of resources in the long run? Form also pushes architecture toward the image. In an age in which architecture is increasingly image-based -- marketed with renderings, consumed as spectacle, and increasingly indistinguishable from a host of other media -- our formless reasserts the primacy of physical and spatial experience. This is not the same experience that has driven the "experience economy" -- the fun-house style atmosphere or affect, utterly reliant on a passive subject, offered by much of today's spectacular architecture. Nor is it the solipsistic, abstract phenomenology of the sublime borrowed by architects from Minimalist and Post-Minimalist work in the visual arts. We do however, aspire to new forms of bodily and psychological interaction between architecture and subject. Our spaces are challenging, lacking clear boundaries or legible hierarchies, and so fundamentally demand interaction and engagement. And radically new space ultimately demands new forms of interaction not only between architecture and subject, but among subjects as well. 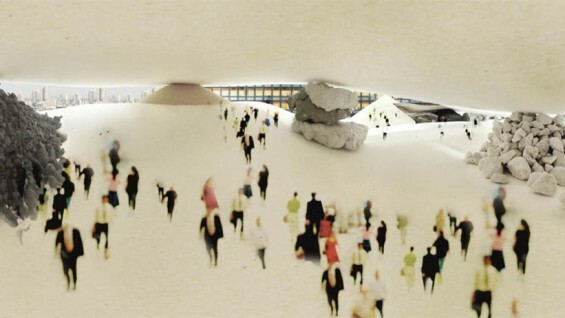 Our formless thus offers not only new understandings of space and material, but of collectivity and social experience. At its core is a reimagining of architecture's best attributes.